Featuring an appealing contemporary style design, the Amish Sedona Server is beautifully crafted to complement modern and contemporary styled dining areas. The cabinet doors on each side are expertly crafted in a curved pattern adding its charm with several shelves for optimal storage and functionality. Pair this server with a contemporary dining set for an elegant appeal in the dining room. Utilize this gorgeous server as a convenient place to hold dining table cloths, formal napkins, and serving dishes while also coupling this server as a space to put wines and drinks to be served throughout dinner, or have it be a convenient spot for a buffet style serving area during gatherings. 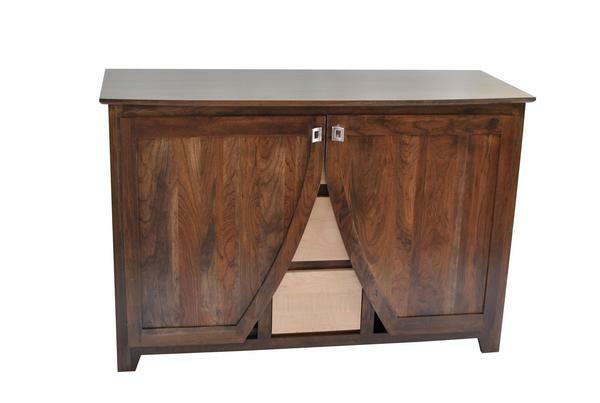 This beautiful Sedona server will provide added storage and serving space to your dining room for generations. Contact a Furniture Specialist or order online today to begin customizing this beautiful dining server for your home.